Showed a new and maimed wonder. To Africanus, Maximus and Pompeius. 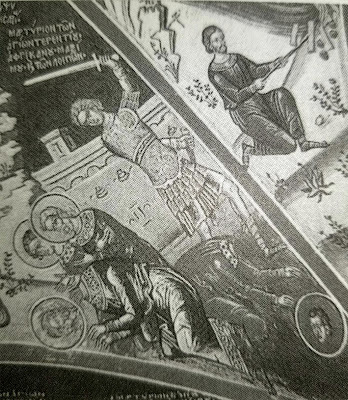 Three worshipers of the Trinity by the sword. Together contested sentenced to the sword. To Africanus, Pompeius and Terence. Crowned with as many needed iambic crowns. You pour forth milk from your neck by the sword. Suffering these things for the Trinity. Terence and Maximus met their end by decapitation. What is the advantage of your beheading Terence? To have not the face or heart turned away. Four times ten, and much more. The Holy Martyr Terence and his companions suffered under the emperor Decius (249-251). The emperor issued an edict commanding all subjects to offer sacrifice to the pagan idols. When Fortunianus was a governor of Africa and received this edict, he gathered the people into the city square, set out cruel instruments of torture and declared that everyone without exception had to offer the sacrifice to the idols. Many, afraid of torture, complied. However, Terence and thirty-nine other Christians resolved to resist the heathens, reminding one another of the words of our Lord: "Do not fear those who kill the body, but are unable to kill the soul; rather fear the One Who is able to send away both soul and body to gehenna" (Matt. 10:28). Therefore they bravely affirmed their faith in the Savior and ridiculed the idols. Fortunianus was amazed at their boldness and he asked how they as rational people, could confess as God, One Whom the Jews crucified as a malefactor. Terence answered that their belief was in the Savior, Who voluntarily endured death on the Cross and rose on the third day, and they were determined to not cast aside the worship due to the Creator to pay homage to demons. Fortunianus saw that Terence inspired the others by his example, and so he ordered him to be isolated in prison with his three closest companions: Africanus, Maximus, and Pompeius. Fortunianus was determined to force the rest of the martyrs, including Zenon, Alexander and Theodore, to renounce Christ. Neither threats nor terrible tortures could sway the holy martyrs. They burned them with red-hot iron, they poured vinegar on the wounds, they sprinkled on salt, and they raked them with iron claws. 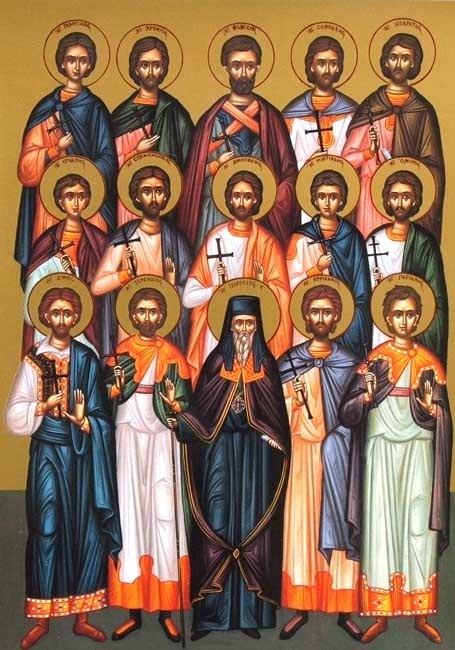 In spite of their sufferings, the saints did not weaken in their confession of Christ, and the Lord gave them strength. Fortunianus gave orders to lead the martyrs into the pagan temple dedicated to Hercules, and once again he urged them to offer sacrifice to the idols. The valiant warriors of Christ cried out, “O Almighty God, Who once sent down fire on Sodom for its iniquity, destroy this impious temple of idolatry.” The idols fell down with a crash, and then the temple lay in ruins. The enraged governor gave orders to have all the martyrs imprisoned, except Zenon, Alexander and Theodore. Fortunianus summoned Zenon, Alexander and Theodore before him. He urged them to offer sacrifice to the idols. The martyrs refused. The governor then ordered they be beaten with thorny and jagged rods and also with ox hide, until the soldiers became exhausted. They were beaten to such an extent that their innards were exposed. After this they were pierced with burning spits, and on the wounds were applied vinegar and salt, rubbing them with material made of coarse hair. Finally, after the holy martyrs had shattered the idols with their prayers, they were beheaded, and received the unfading crowns of martyrdom. Later the governor called for Terence and his companions. Having boldly confessed Christ again, they were thrown back in prison, but this time they were fettered in chains on the arms and feet, and beneath them were placed iron spikes. Furthermore, they were given nothing to eat or drink, and in this manner they passed several days. However, God did not allow his martyrs to suffer in this manner, so by night, an angel of the Lord removed the martyrs’ chains and fed them. In the morning, the guards found the saints cheerful and strong. Then Fortunianus ordered them to be lacerated and then cast to the wild beasts as food, but the wild beasts did not harm them. The furious Fortunianus then gave orders to behead the holy martyrs. Christians took up their holy bodies and buried them with reverence outside the city. * Regarding the names of the other martyrs not named above, the tradition that has been passed down is the following: Anaxarchos, Anaximenes, Aristides, Chronios, Demaratos, Democles, Demosthenes, Dionysios, Elias, Epaminondas, Eteokles, Hephaistion, Hercules, Homer, Isaiah, Isocrates, Luke, Miltiades, Mnesarchos, Parmenion, Pelopidas, Pericles, Philopoimen, Phokion, Pindaros, Polybios, Polynikos, Prometheus, Socrates, Sophocles, Themistocles, Theophrastos, Theseus, Thomas, Timothy, Titus, Xenophon. ** On this day is commemorated the Synaxis of these three Martyrs in the Monastery of Paulopetrion on the Gulf of Nicomedia in Bithynia. *** Zenon, Alexander and Theodore are only commemorated by name on April 10th. A chosen army of athletes from Africa, contested nobly for the faith. They were of one mind and heart, and of one accord in their struggle. Now they intercede that we all may be saved. Let us celebrate the memory of Terence and his companions, and draw near to receive healing. For with grace and power of the Spirit, they heal the sicknesses of our souls.